A busy lifestyle, often involving dashing from one thing to another, can leave you feeling less than fresh. 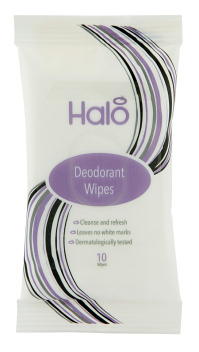 Halo deodorant wipes provide the ideal personal care solution ensuring ‘freshness on the go,’ wherever you are. Cleansing and refreshing, these wipes contain a non-sting lotion, making them great for sensitive underarm areas and they won’t leave white marks on your clothes. Dermatologically tested, they not only clean and freshen but also provide effective deodorant protection on the skin, so no need to carry a deodorant can or stick with you. Halo deodorant wipes fit discreetly in your gym bag, your desk drawer at work, your handbag, or travel bag – guaranteeing confidence and freshness everywhere.